A sampling of recent reports shows just how much immuno-oncology continues to grow. Last month, GrandView Research projected a more than doubling of the global cancer immunotherapy market, from the $58.1 billion it tallied in 2018, to $126.9 billion by 2026. As GEN noted when it ranked the top immuno-oncology startups in February, market projections range from $124.88 billion (Transparency Market Research) to $173 billion (Market Research Engine) by 2024. Behind the sunny forecasts is the expectation of numerous new treatments reaching market, following a significant increase in clinical activity. The Cancer Research Institute (CRI) in November recorded an approximately 50% year-over-year increase—from 1502 in September 2017 to 2250 in September 2018—for the number of clinical trials evaluating just one category of cancer immunotherapies, programmed death-1 (PD-1) and programmed death-ligand 1 (PD-L1) immune checkpoint inhibitors. CRI’s findings were based on data from ClinicalTrials.gov as well as its own internal database, and published as “The clinical trial landscape for PD1/L1 immune checkpoint inhibitors,” in Nature Reviews Drug Discovery. According to CRI, most of the trials (1716) were evaluating treatment regimens that combine PD-L1 immunotherapies with other cancer therapies, with a total 240 targets under study. However, CRI’s report also presented a more sobering statistic: All the trials it tallied would require 380,900 patient volunteers, up more than 100,000 from the previous year. Yet the recruitment rate for immuno-oncology trials has fallen from 2014, when it was 1.15 patients per site per month, to just 0.35 patients per site per month in 2018. Increasing patient recruitment will be a formidable challenge for cancer immunotherapy developers; yet it is necessary to sustain the momentum generated by biopharmas through their immuno-oncology collaborations. The total value of this year’s top-10 immuno-oncology collaborations as ranked by GEN is approximately $39.992 billion, up 16% from the $34.513 billion total for the 10 partnerships on last year’s A-List, and up 52% from the $26.233 billion total for the 10 partnerships ranked in 2017. During that period, the No. 10 collaboration has grown in value from a potential $1.5 billion, to $2.1 billion, to $2.6 billion. Half of the top-10 collaborations were launched since January 2018, including two that were initiated since publication of GEN’s 2018 A-List on the topic. Those two partnerships were large enough in value to be ranked third and fourth on this year’s A-List—and, even more significantly, they included participation by three biopharma giants, reflecting growing interest in immuno-oncology by the largest drug developers. Servier’s up-to-€1.7 billion ($1.9 billion) partnership with Pieris to co-develop Pieris’ PRS-332 and up to seven other immuno-oncology bispecific drug candidates. The companies have five programs under development: PRS-332, PRS-344, and three undisclosed discovery-phase programs. The up-to-$2.17 billion alliance of Sanofi and Regeneron Pharmaceuticals, launched in 2015 and restructured in January. The FDA approved the lead drug of the alliance, the PD-1 inhibitor Libtayo® (cemiplimab-rwlc), in September 2018. Novartis’ up-to-$2.56 billion partnership to co-develop Xencor’s T-cell-engaging XmAb bispecific antibodies. Novartis will cede XmAb13676 back to Xencor in June, while a Phase I trial (NCT02730312) of XmAb14045 is on a partial clinical hold following the deaths of two patients linked to the candidate. Below is GEN’s updated A-List of the top-10 immuno-oncology collaborations, ranked by dollar value as disclosed by the companies in regulatory filings, press announcements, and other public statements. Each collaboration is listed by partner names, value, and date announced, followed by a summary and updates provided by the companies since their launch announcements. Summary: Celgene received options to develop and commercialize jointly cancer immunotherapies that included Jounce’s lead candidate JTX-2011, a mAb-targeting ICOS (the Inducible T-cell CO-Stimulator), and other cancer immunotherapies. Celgene gained options from Jounce for up to four of its early-stage programs to be selected from a defined pool of B cell-, regulatory T cell-, and tumor-associated macrophage targets emerging from the Jounce Translational Science Platform; and an additional option to share JTX-4014, Jounce’s PD-1 product candidate, equally with Jounce. The collaboration has an initial term of four years, which may be extended up to three additional years. Updates: Jounce plans to present positive JTX-2011 clinical data on April 2 at the 2019 American Association for Cancer Research (AACR) Annual Meeting. Data will come from part of Jounce’s Phase I/II ICONIC trial (NCT02904226), an open-label study evaluating JTX-2011 alone and in combination with Bristol-Myers Squibb (BMS)’s Opdivo® (nivolumab). The trial is also assessing combinations of JTX-2011 with BMS’ Yervoy® (ipililumab) and Merck & Co.’s Keytruda® (pembrolizumab). Jounce also plans to present a poster detailing a preclinical evaluation of JTX-8064, the company’s lead tumor-associated macrophage product candidate targeting Leukocyte Immunoglobulin Like Receptor B2 (LILRB2). Jounce expects to file an IND and launch a Phase I trial for JTX-8064 this year. On January 3, Jounce said it completed enrollment in the first cohort for its Phase I dose escalation clinical trial (NCT03790488) of JTX-4014 in patients with solid tumors. JTX-4014 is a fully human IgG4 mAb designed to specifically bind to PD-1 and block its interaction with its ligands, PD-L1 and PD-L2, to augment antitumor T-cell activity. Summary: Merck KGaA, Darmstadt, Germany, agreed to jointly develop and commercialize its PD-L1 checkpoint inhibitor now called Bavencio® (avelumab) with Pfizer, both alone and in combinations with the companies’ oncology therapies. Updates: The companies have reported three recent clinical setbacks. On March 19, they said they would discontinue the Phase III JAVELIN Ovarian PARP 100 study (NCT03642132) evaluating chemotherapy followed by maintenance therapy of Bavencio plus Pfizer’s Talzenna® (talazoparib), a poly (ADP-ribose) polymerase (PARP) inhibitor, in treatment-naïve patients with locally advanced or metastatic ovarian cancer (Stage III or IV). Pfizer and Merck KGaA blamed factors that included disappointing interim results. In December 2018, Merck KGaA and Pfizer terminated the Phase III JAVELIN Ovarian 100 study (NCT02718417) assessing Bavencio with and/or following platinum-based chemotherapy in previously untreated patients with ovarian cancer. The companies cited topline results showing Bavencio would not achieve superiority over chemotherapy in the prespecified primary endpoint of progression-free survival (PFS). In November 2018, Merck KGaA and Pfizer acknowledged that Bavencio failed the Phase III JAVELIN Ovarian 200 trial (NCT02580058) by missing prespecified primary endpoints of PFS or overall survival (OS) either alone or in combination with pegylated liposomal doxorubicin (PLD) chemotherapy in patients with platinum-resistant or -refractory ovarian cancer, compared with PLD alone. Bavencio reached the market in 2017, with indications in metastatic urothelial cancer and Merkel cell carcinoma (MCC)—the first approved MCC treatment. That year, the FDA granted its Breakthrough Therapy designation for Bavencio in combination with Pfizer’s Inlyta® (axitinib) for treatment-naïve patients with advanced renal cell carcinoma (RCC). The combination showed significant PFS improvement over Pfizer’s Sutent® (sunitinib), according to topline results from the Phase III JAVELIN Renal 101 trial (NCT02684006) announced in September 2018. Summary: The companies are continuing a collaboration launched by Pfizer and Cellectis in 2014, when Pfizer gained exclusive rights to develop and commercialize Chimeric Antigen Receptor T-cell (CAR-T) cancer immunotherapies directed at 15 targets of its choosing, using Cellectis’ CAR-T platform. In 2015, Servier acquired exclusive rights from Cellectis for UCART19, for up to $338 million-plus, then granted Pfizer exclusive rights to develop and commercialize UCART19 in the United States, while retaining ex-U.S. rights. Updates: In April 2018, Pfizer contributed UCART19 (plus 16 preclinical CAR T cell candidates licensed from Servier and Cellectis) to Allogene Therapeutics, a startup created with $300 million in Series A financing from a consortium whose members included Pfizer. Allogene assumed Pfizer’s strategic collaboration and license agreement with Cellectis, under which Cellectis is eligible for up to $185 million per product tied to achieving development, regulatory, and commercial milestone payments, plus tiered royalties on net sales of commercialized products. Pfizer took an approximately 25% stake in Allogene. That stake shrunk to approximately 18% in October 2018, when Allogene carried out an IPO that resulted in Pfizer’s preferred stock converting into common stock, Pfizer stated in its Form 10-K for 2018. Separately, Pfizer has maintained the approximately 7% ownership stake it took in Cellectis when the collaboration launched. UCART19 is in a Servier-sponsored Phase I program in relapsed/refractory acute lymphoblastic leukemia (r/r ALL), both pediatric (“PALL”, NCT02808442) and adult (“CALM”, NCT02746952). In December 2018, Servier and Allogene announced positive clinical data pooled from both trials. On January 28, Allogene announced FDA clearance of an IND for a second CAR-T candidate, ALLO-501, with plans to launch the ALPHA Phase I trial in up to 24 patients with relapsed/refractory non-Hodgkin lymphoma in the first half of this year. Summary: In an expansion of an up-to-$1.242 billion, up-to-four target cancer immunotherapy collaboration announced May 27, 2014, BMS and CytomX agreed to discover up to eight additional targets—six oncology targets, two non-oncology—using CytomX’s Probody™ drug discovery platform. CytomX granted BMS exclusive worldwide rights to develop and commercialize the eight targets. BMS agreed to pay CytomX $200 million upfront, plus research funding, and up to $448 million per candidate tied to achieving development, regulatory, and sales milestones, plus tiered royalties on net sales of each product commercialized by BMS. CytomX said the terminations will not affect the first Probody therapeutic to advance to the clinic through the collaboration, BMS-986249, which is in a Phase I/II trial (NCT03369223). The trial is designed to evaluate BMS-986249 alone and in combination with BMS’ Opdivo® (nivolumab) in advanced, metastasized solid tumors. BMS anticipates preliminary data later this year. During 2017, BMS selected all four oncology targets called for under the original agreement—BMS-986249 and three preclinical programs. CytomX said BMS-986249 could localize CTLA-4 antibody activity to the tumor microenvironment, thereby limiting systemic toxicities normally seen with BMS’ marketed CTLA-4 monoclonal antibody Yervoy® (ipililumab). At the 2017 Society of Immunotherapy of Cancer meeting and 2018 Keystone Drugs as Antibodies Conference, BMS presented positive preclinical efficacy data for BMS-986249. Summary: Kite, a Gilead Company, agreed to modify genes through Sangamo Therapeutics’ zinc finger nuclease (ZFN) gene editing technology platform to develop autologous and allogeneic next-generation ex vivo cell therapies for different cancers. Kite agreed to pay Sangamo $150 million upfront, and up to $3.01 billion in payments tied to achieving research, development, regulatory, and commercialization milestones, aggregated across 10 or more products. Sangamo would also be eligible for tiered royalties from Kite on sales of products resulting from the collaboration. Kite agreed to oversee all development, manufacturing, and commercialization of products under the collaboration, as well as shoulder agreed-upon expenses incurred by Sangamo. Update: In its presentation to analysts of fourth-quarter and full-year 2018 results on February 4, and discussion of “Pipeline Milestones Anticipated in 2019-2020,” Gilead said it intended to file an IND for KITE-037, an allogeneic anti-CD19 CAR-T cell therapy created through the collaboration, in the latter half of 2019. Summary: The companies will partner to co-develop Nektar’s lead immuno-oncology program NKTR-214 in combination therapies with BMS’ marketed cancer immunotherapy Opdivo® (nivolumab), as well as with both Opdivo and BMS’ other marketed cancer immunotherapy blockbuster drug, Yervoy® (ipilimumab), in more than 20 indications across 9 tumor types. Those tumor types include melanoma, renal cell carcinoma, non-small cell lung cancer (NSCLC), bladder cancer, and triple-negative breast cancer. Pivotal studies in renal cell carcinoma and melanoma are expected to be initiated in mid-2018. BMS and Nektar also agreed to study additional combination therapies with other anticancer agents originating from either company, and/or third parties. Updates: In June 2018, BMS reported positive preliminary data from the ongoing PIVOT Phase I/II Study (NCT02983045) evaluating BMS’ Opdivo with Nektar’s Bempegaldesleukin (NKTR-214). BMS also reported that the combination met prespecified efficacy criteria in first-line melanoma, first-line renal cell carcinoma, and first-line urothelial cancer. In urothelial cancer, the companies released additional data February 15 in which the combination showed a best overall response rate of 48% (13 of 27) in efficacy-evaluable patients, with a 19% (5 of 27) complete response rate. BMS and Nektar launched a Phase III trial of the combination in patients with previously untreated unresectable or metastatic melanoma (NCT03635983) in September 2018. Three months later, the companies initiated two Phase III studies: PIVOT-09, comparing the combo to tyrosine kinase inhibitor (TKI) monotherapy in patients with advanced metastatic renal cell carcinoma; and PIVOT-10, assessing the combo in cisplatin-ineligible urothelial carcinoma patients whose tumors express PD-L1 (combined positive score <10). Summary: The companies agreed to co-develop and co-commercialize M7824 (bintrafusp alfa), a bifunctional fusion protein immunotherapy designed to simultaneously target two immunosuppressive pathways—transforming growth factor-β (TGF-β) trap and an anti-programmed cell death ligand-1 (PD-L1)—that are commonly used by cancer cells to evade the immune system. M7824 is now in clinical development, including potential registration studies, for multiple difficult-to-treat cancers. Among those studies are a Phase II trial designed to compare M7824 with Merck & Co.’s Keytruda® (pembrolizumab) as a first-line treatment in patients with PD-L1 expressing advanced non-small cell lung cancer (NSCLC), and several Phase I studies assessing M7824 in solid tumors. The FDA and the Euro­pean Medicines Agency (EMA) granted orphan drug designation to M7824 for the treatment of biliary tract cancer in December 2018. Summary: Genentech, a member of the Roche Group, agreed to use Affimed’s proprietary Redirected Optimized Cell Killing (ROCK®) platform, designed to enable generation of both NK cell– and T cell–engaging antibodies, with the goal of discovering and advancing first-in-class, tetravalent, innate immune cell engager-based immunotherapies of interest to Genentech. The collaboration is intended to generate candidates through Affimed’s ROCK platform as well as multiple undisclosed solid and hematologic tumor targets. 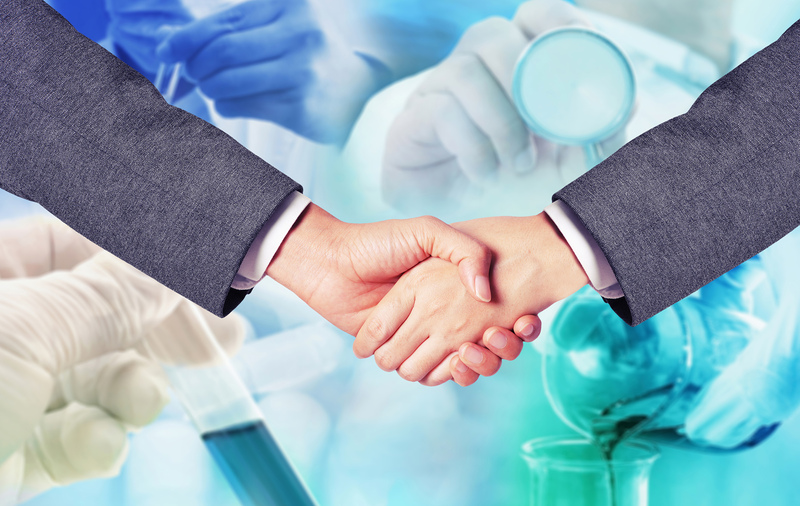 Affimed and Genentech have agreed to partner on the discovery, early research, and late-stage research phases; with Genentech agreeing to oversee clinical development and commercialization worldwide. Genentech agreed to pay Affimed $96 million upfront, and up to an additional $5 billion in payments tied to achieving development, regulatory, and commercial milestones, as well as to royalties on sales. Updates: During Affimed’s quarterly conference call following release of third-quarter 2018 results on November 7, 2018, CEO Adi Hoess, MD, PhD, told analysts that the Genentech collaboration was transformational, adding: “We also believe it can be a door opener to further collaborations and also to leading to certain appreciation of our own programs in the field of CD16A in NK engagers,” according to a transcript published by Seeking Alpha. Investors responded to the collaboration agreement with a buying surge that more than tripled the price of Affimed shares to $5.55 on August 28, from $1.60 the previous day. Summary: Merck & Co. partnered with Eisai to codevelop its marketed cancer treatment Lenvima® (lenvatinib mesylate) for additional oncology indications, both alone and in combination with Merck’s Keytruda® (pembrolizumab). Eisai and Merck agreed to jointly launch new clinical studies evaluating the Lenvima/Keytruda combination in 11 potential indications covering six types of cancer—endometrial cancer, non-small cell lung cancer (NSCLC), hepatocellular carcinoma (HCC), head and neck cancer, bladder cancer, and melanoma—as well as a “basket” trial targeting multiple unspecified cancer types. Updates: On August 16, 2018, Lenvima won FDA approval for first-line treatment of patients with unresectable HCC. Lenvima was first approved in 2015 in locally recurrent or metastatic, progressive, radioactive iodine-refractory, differentiated thyroid cancer, and a year later was approved in combination with everolimus for patients with advanced renal cell carcinoma following one prior anti-angiogenic therapy. At the 33rd Annual Meeting of the Society for Immunotherapy of Cancer, held November 9–11, 2018, in Washington, DC, Merck and Eisai presented positive data and analyses of the Lenvima/Keytruda combination from the ongoing Phase Ib/II (Study 111/KEYNOTE-146 trial (NCT02501096) showing “encouraging” tumor activity in three different tumor types, metastatic melanoma, metastatic NSCLC, and metastatic urothelial carcinoma. In metastatic melanoma, nearly half (47.6%) of the trial’s 21 melanoma patients met the primary endpoint of objective response rate at week 24, compared with 33% of 21 NSCLC patients and 25% of 20 metastatic urothelial cancer patients. During the first nine months of Eisai’s current fiscal year (April–December 2018), Lenvima generated ¥43.3 billion ($388.9 million), Eisai reported on February 4, surpassing the ¥32.2 billion ($289.2 million) reported for April 2017–March 2018. Lenvima has been projected by Thomson Reuters to generate $3.46 billion in revenue by 2022. Summary: In an up-to-€4.08 billion ($4.6 billion), four-year expansion of an up-to-€1.7 billion ($1.9 billion) collaboration launched in 2014, the companies agreed to discover and develop up to 12 additional cancer drugs based on single-domain antibody fragments (“Nanobodies®”), through preclinical proof-of-concept. After that, Merck & Co. has the option to advance specific lead candidates. Merck will also oversee clinical development, manufacturing, and commercialization of any products resulting from the collaboration, now at 17 Nanobodies programs. Last year, Ablynx started an IND-enabling toxicology study with a bispecific Nanobody—triggering a €2.5 million ($3.1 million) milestone payment to Ablynx in June 2017—and completed a second in vivo proof-of-concept study with a mono-specific Nanobody. Ablynx also said it received €33 million ($40.7 million) upfront and €6 million ($7.4 million) in preclinical milestone payments from Merck. Beyond cancer, Sanofi benefited from acquiring Ablynx on February 6, when the FDA approved the Ablynx-developed Cablivi® (caplacizumab-yhdp) in combination with plasma exchange and immunosuppression for acquired thrombotic thrombocytopenic purpura (aTTP) in adults. Cablivi received European approval for aTTP in September 2018. However, on February 7, Sanofi disclosed that it removed from its pipeline another Ablynx-developed Nanbody candidate, ALX-0171, which was in Phase II for Respiratory Syncitial Virus (RSV). 1. Deal value reflects only the six oncology targets among the eight additional targets BMS and CytomX agreed to add in 2017; the other two were to be in non-oncology indications. The value for all eight targets is $3.786 billion.